Celebrating the 4th of July with a backyard cookout? Don't forget to provide lots of things for the kids to do. We've rounded up five fun activities to keep them happy all day long. 1. Build a water wall. All you need is a peg board, some tubing, and a few up-cycled containers. You can find tons of inspiration here. Construct it before hand for little kids or fill up even more of the day by letting older kids get in on the building fun. 2. Paint with ice cubes. This couldn't be more simple. 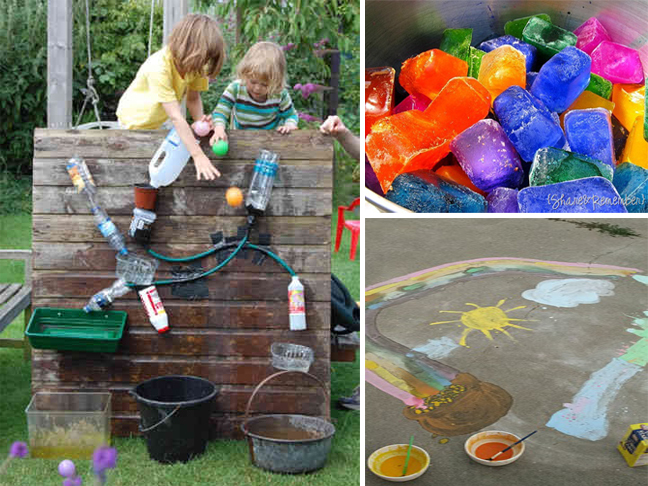 Just fill some ice cube trays with various colors of paint and water and, presto!, you've got homemade outdoor art supplies. For ideas on what to use as your canvas, see this post. 3. And while you're freezing things, put a bunch of treasures (along with some of those colored ice cubes) into a container in the freezer. Once frozen, bring it outside and invite the kiddos to get excavating. Click here for a list of materials to use when trying to free your treasures. 4. Sidewalk chalk is cool but sidewalk chalk paint is super cool. We love how the colors blend to make all sorts of beautiful creations. 5. And it's not a real backyard shin dig until you break out the water balloons. Go the extra mile and make these angry bird versions to really thrill the kids.